New membership is ongoing. Fees are assessed upon acceptance and then annually on January 1, with the exception of a one-time payment for a Life membership. Annual deadline for dues is April 30. Members admitted between July 1 and December 31 pay half of the annual dues for that year. There are over 150 current members of PKHCC. Download Membership Application form (updated 2014). 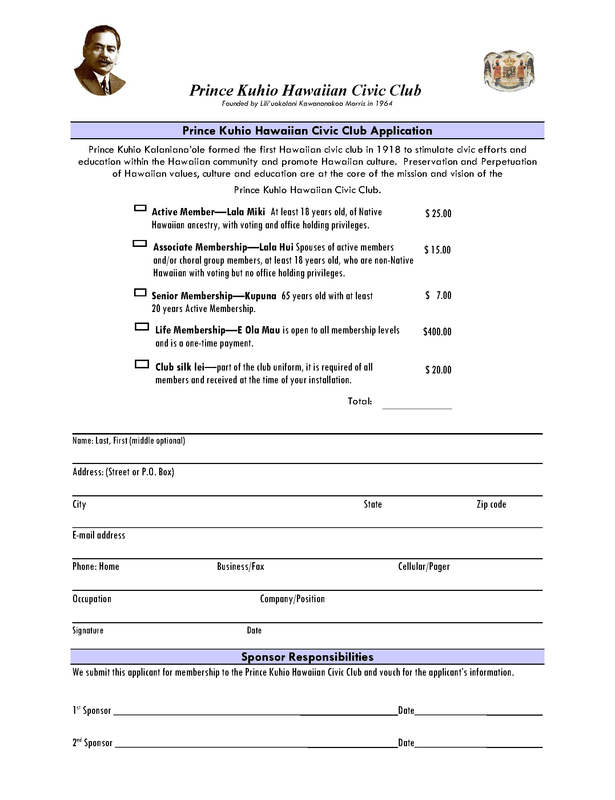 Print, fill out, and send to PKHCC. Signed by two sponsors who are active members in good standing. Referred to the Membership Committee. The report and recommendations of the Membership Committee are sent to the PKHCC Board of Directors. Eligibility: Aged 18 or over, of Hawaiian ancestry and of good standing in the community. Privileges: Right to vote on questions, hold office, serve on committees and take the floor and speak on all questions. Membership fees: $25.00 per year. Eligibility: Spouse of an active member or any member of the Prince Kuhio Hawaiian Civic Club Choral Group and of good standing in the community. Privileges: Rights and privileges of active members, except holding the position of any officer or director. Membership fees: $15.00 per year. Eligibility: Open to any active member in good standing for at least twenty years, who has reached the age of sixty-five years. Privileges: Rights and privileges in the categories which they formerly enjoyed. Membership fees: $7.00 per year. Eligibility: Any member in good standing, by a majority vote of the Board of Directors and upon payment of the life membership fee. Eligibility: Patrons and donors to PKHCC, upon recommendation of the Board of Directors and by a 2/3 vote of the members present at a regular meeting. Privileges: Rights and privileges of active members, except holding office and the right to vote. Eligibility: Any person under 18 years of age and of Hawaiian ancestry. Privileges: May organize and elect their own officers under the supervision of an Advisory Committee appointed by the Board of Directors. The Junior member shall have representation at all Board of Director meetings in the person of one delegate elected by the Junior Board.